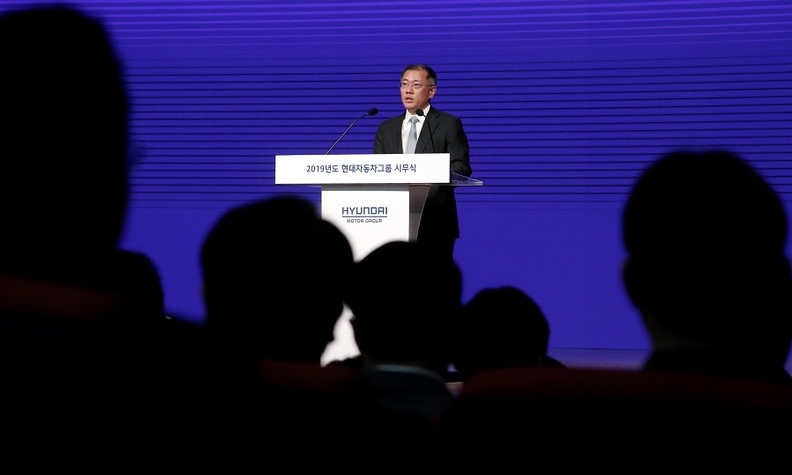 Hyundai and Kia would complete a restructuring, heir apparent Euisun Chung said. The reorganization is expected to pave the way for him to succeed his octogenarian father as head of the group. SEOUL -- Hyundai Motor flagged another year of tepid car sales growth on the back of a slow 2018. The automaker said trade protectionism adds uncertainty and major markets such as the U.S. and China remained sluggish. Hyundai and Kia - together the world's fifth-biggest automaker - set what they called a "conservative target" of 7.6 million vehicle sales in 2019, a 3 percent increase from the 7.399 million vehicles sold last year. The 2018 sales fell short of the group's target of 7.55 million vehicles, marking their fourth consecutive annual sales goal miss. Hyundai and Kia sold 7.25 million vehicles in 2017. Group heir apparent Euisun Chung said Hyundai and Kia would complete a restructuring of South Korea's second-biggest conglomerate, which is widely expected to pave the way for him to formally succeed his octogenarian father as head of the group. The complicated succession plans come as Hyundai contends with a bunch of problems that have cost it market share in China and the U.S. and stalled its rise up the ranks of global automakers. It missed a boom in SUVs, faces potential U.S. tariffs and a U.S. investigation over how it handled a vehicle recall, and lost ground in technological advances such as self-driving cars. "Business uncertainties are heightening as the global economy continues to falter. Walls of protectionism are being constructed around the world," Chung, 48, told hundreds of employees at the group's headquarters in Seoul in his first New Year address. "Internally, we face challenging tasks such as stabilizing business in major markets like the U.S. and China, while simultaneously enhancing our responsiveness to drive future growth," Chung said. The group said it would launch 13 new or face-lifted models in 2019, including a Genesis premium SUV and the Sonata sedan. "Hyundai will be launching new models, but competitors will be also doing so, making it difficult for Hyundai to increase shares in the sluggish markets in China, U.S. and Europe," said Sean Kim, an analyst at Dongbu Securities. He also said he would "actively communicate with" shareholders, an apparent reference to U.S. hedge fund Elliott Management Corp. which effectively scuttled a previous restructuring plan last year.